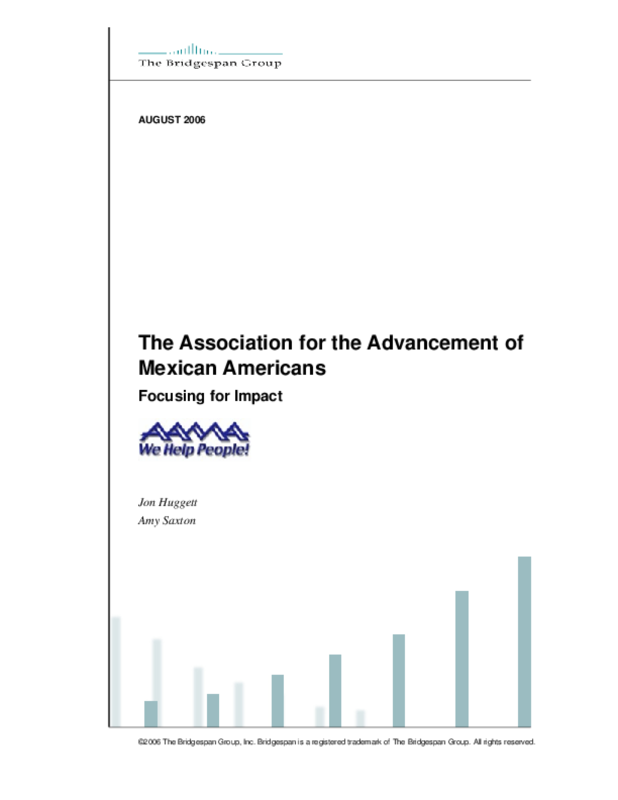 In 2005 the Association for the Advancement of Mexican Americans (AAMA) was providing services to more than 30,000 individuals annually through nearly 30 different programs. Its extensive program portfolio served clients of all ages and of many ethnic and racial groups in five Texas cities. All signs were pointing to growth: AAMA's services were in increasing demand given the soaring Latino population; AAMA's leadership was eager for the organization to magnify its impact; multiple funding partners were interested in investing in AAMA's expansion. While the growth imperative was unambiguous, the specific path was not. Should AAMA's leadership expand all of the organization's programs, or concentrate on a few? To chart a course, they got crystal clear about the people they most wanted to serve (first and foremost at-risk Mexican American youth in Texas) and the benefits they wanted to help create for these individuals (e.g., increased college graduation rates, improved job preparedness, decreased substance abuse). Reviewing AAMA's programs, they saw that some were better aligned with these priorities than others. Acting on this information, they concluded that AAMA could do the most good by focusing its energies on enhancing and growing the tightly-aligned programs. Copyright 2006 The Bridgespan Group Inc.